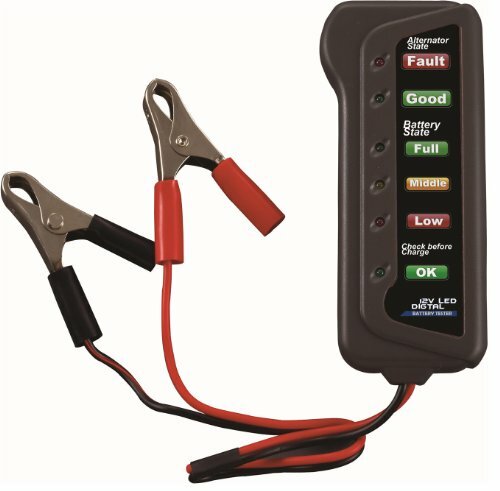 A car battery tester is a convenient device that can help you monitor the condition of your car battery. In this article, we’ll explore the best car battery tester to buy. Automotive maintenance isn’t just about keeping your exterior sleek and shiny. One important thing to keep in condition is your car’s battery. By testing it regularly, you reduce the chance of the battery failing too soon. How to care for cars battery? How to perform a load test? How to test a car battery with a multimeter? How to test a car alternator? How often to replace a car battery? How to tell if a car battery is bad? Also, if you want to learn more about the different kinds of batteries, check out these articles – Best Car Battery, Best Marine Battery and Best Truck Battery. It’s essential to use a tester which works with multiple types of batteries, from conventional, AGM, gel cell, spiral wound and deep cycle. You should always keep a type of battery analyzer handy, in case of an emergency. With one on hand, you can always check if your battery is at risk of damage due to corrosion or other kinds of weaknesses. Find out the list below for some of the best cost-effective car battery tester. The BA9 from Clore Automotive can offer you fast, accurate testing of 12-Volt batteries, starting systems, and even charging systems. This tester will measure voltage ranging from 7-volt to 15-volt and comes fitted with two clamps. It can be used in a lot of different types of batteries like the AGM Flat Plate, Gell Cell, Flooded Acid, and many more. 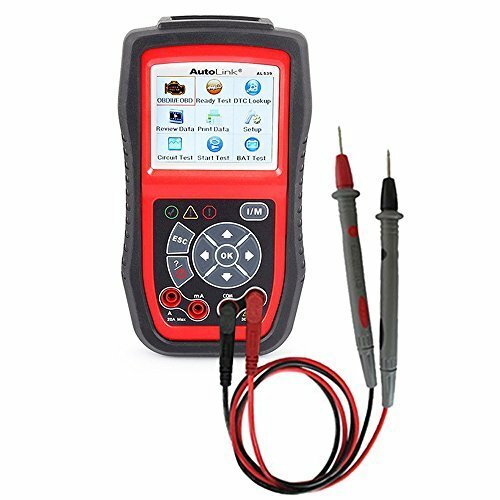 You can use this digital battery tester to assess different kinds of rating systems like CCA DIN and IEC. It’s also very safe to use because of the safety features in place. That includes the reverse polarity and over-voltage protection properties in this battery. Plus, its LED display lights up so you can see the results clearly in any kind of lighting. Another batter tester from this brand that you might want to look into is the Clore Automotive Solar BA7. They both have the same features, but the BA7 smaller CCA range of 100 – 1200 CCA range. If you want the quickest reading possible, get the MP0514A from Motopower. It has a microprocessor installed in its system to allow for fast and accurate assessments of your battery. Its LED display is colored to make reading the voltage easier. Additionally, it has a mode where it can tell whether your battery needs to be jumped or needs to be replaced. The left side indicator will let you know if your battery status is full, medium, low, and empty. On the right side is the alternator status light which will let you know your alternator condition. It also has excellent safety protection features installed like reverse polarity, short circuit, and overload protection. Another great tester to try out, the BT-100 battery load tester from Schumacher is an excellent choice and deliver an accurate result. It can test both 6V and 12V batteries that have up to 1000 CCA. That means you can use it for your car, your motorcycle, RV, ATV, and even your boat. It does a 100-Amp load test for 12V batteries, and a 50-Amp load test for 6V batteries, and is excellent for everyday use. 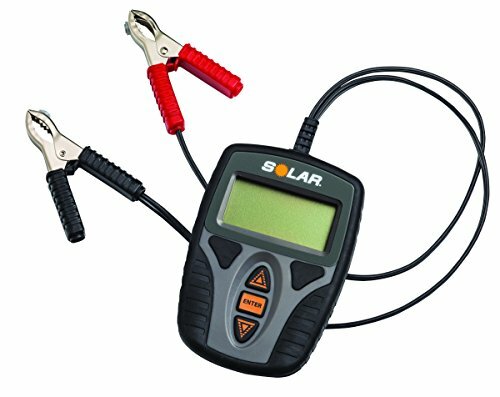 This battery tester has a shock-resistant meter covered in a steel case, so you know it’s highly durable. Plus, its top-mounted rocker switch makes it super easy to operate. The great thing about the INNOVA 3721 Battery Monitor is that you can plug it into your car’s cigarette lighter to check on your battery and charging system. Its LCD shows you a bar graph to help you tell the battery charge level of your car. It also has color-coded LEDs indicating your charge status for a quick assessment. 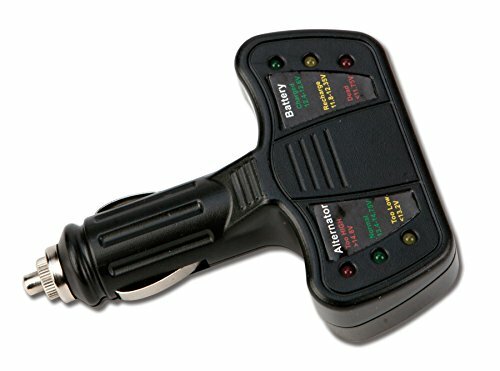 Also, this battery tester is designed to protect your engine computer as well as other 12V accessories from the damages of surges during jump starts and recharging. The E-Z Red let you quickly measuring acidity and alkaline storage battery solution. 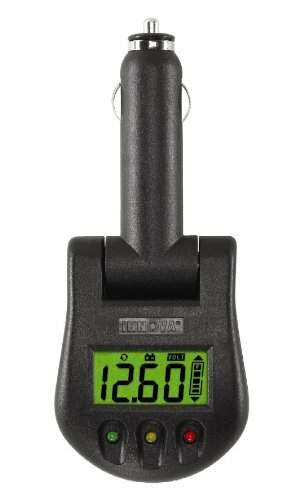 It has an easy-to-read pointer to show you an accurate density range of 1.100-1.300. It is designed to fit inside small places. The body is made with thick plastic. Hence, it’s very durable. Many famous battery manufacturer engineers use this battery hydrometer during on-line testing. With the trust of many professionals behind it, you know you’re getting your money’s worth in performance. Overall, this E-Z Red SP101 battery hydrometer small, compact design and easy to use. 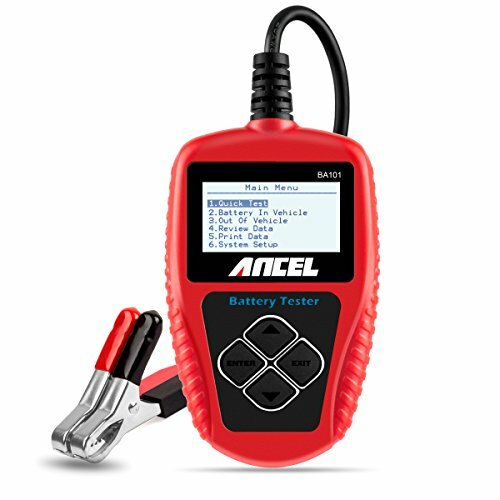 If you want a small and compact battery tester, then the BA101 from ANCEL is perfect. It is also straightforward to use which makes it a great starting tester for beginners. Also, it came with a 3.0 feet long cable and made of a very thick flexible insulator for extra safety. This tester can analyze 12V batteries with a range of 100-1200 CCA. It does so in different rating systems like CCA, BCI, IEC, and DIN standards. The BA101 can accurately tell you all about your battery’s voltage, charge, cranking power, and even how much battery life is left in it. Plus, it even has an excellent 2-year warranty in place. 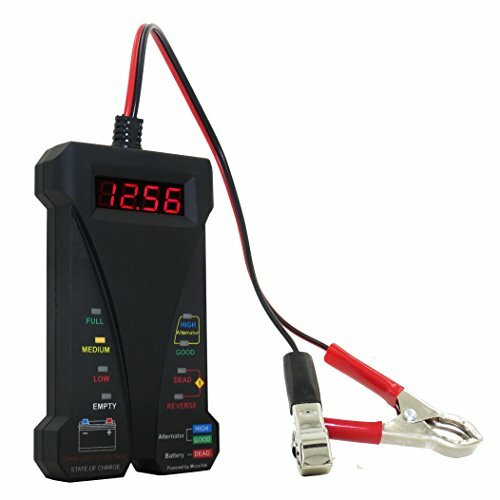 It’s a 130-Amp digital battery tester that can test both 6V and 12V batteries. It has a large display which makes it easy to read the results of the test, as well as an easy-grip ergonomic handle for better operation. A simple on/off switch is located right at your fingertips. This tester can tell you your battery’s state of charge and charging system. It can even perform load tests, starter tests, and alternator ripple tests. 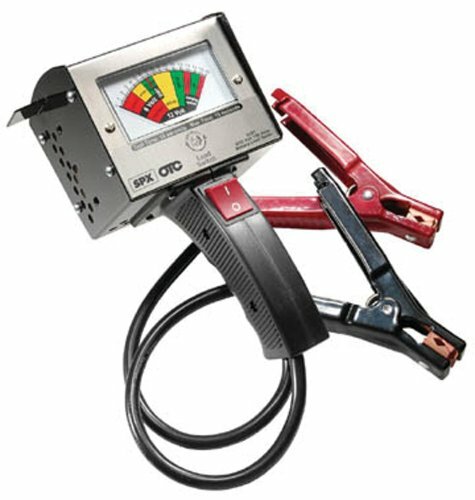 Also, this battery tester comes with two heavy duty clamps are used in connection to both positive and negative terminals. 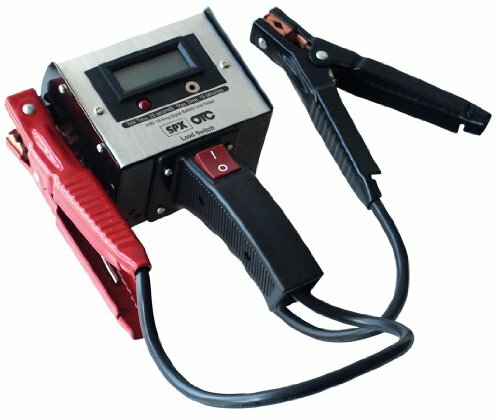 If you like the features in this model, you might want to look at the OTC 3181 130 Amp Heavy-Duty Battery Load Tester. They have the same features except that the OTC tester has a Manual display. 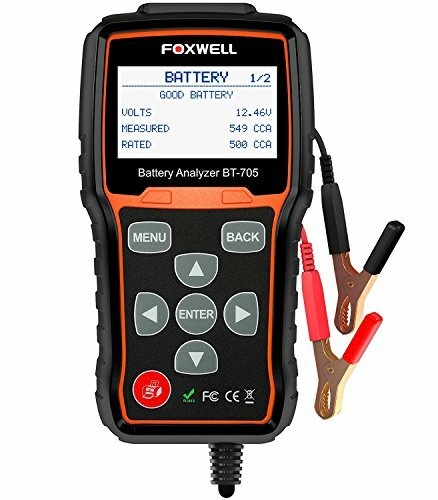 The Foxwell BT705 is an all-in-one come with battery tester and charging system analyzer. 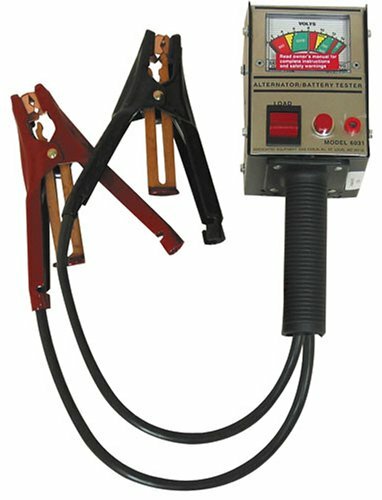 This tester is made to measure automobile battery that is either 12-volts or 24-volts, along with a matching charging system. This device will analyze the vehicle alternator information and troubleshoots faulty charging systems. Performing a cranking test will display the decision on the starter system, cranking voltage, and cranking time (in milliseconds). This device also supports many languages: English, French, German, Russian, Spanish, Dutch and Italian. Overall construction is very sturdy and able to resist damage, great for technicians and mechanics. The device design fits right onto the palm, making it an excellent addition to your toolbox. Are you looking to buy a battery alternator tester? 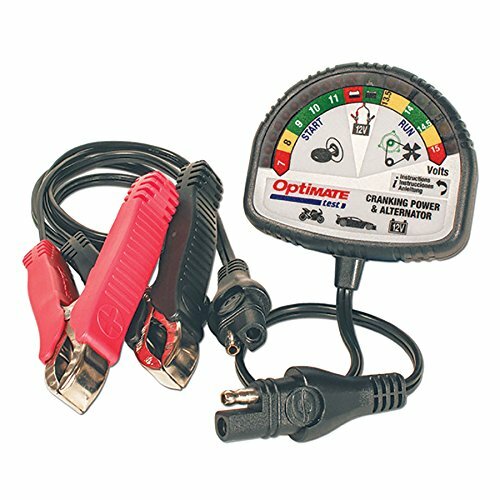 Easy to use battery / alternator tester. 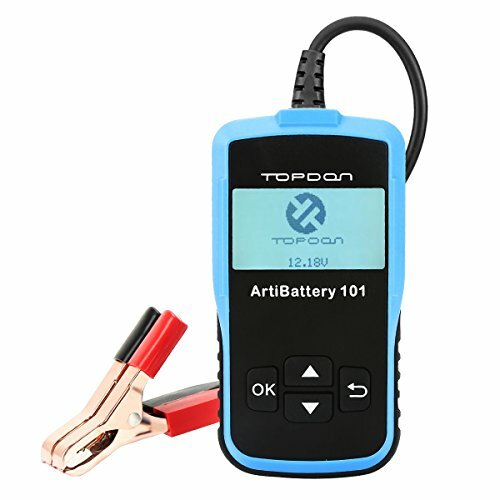 How to Buy A Car Battery Tester? You can’t just buy a car battery tester out of the whim. Of course, you would want a tester that will perform at its best in conjunction with the battery you have. Knowing if you have a 12V car battery or a 24V one isn’t enough. There are many types of batteries: gel, AGM, Lithium-Ion, and many more. Make sure to get a tester that works well with the type of battery you have. More commonly, you wouldn’t have a problem if you get a battery tester that measures the output voltage of your battery. That means that most battery testers can test a wide range of voltage in car batteries. The display screen of your battery tester is an essential factor you need to consider. It has to show all the information you need precisely and clearly. Get a screen that is sufficiently large enough for you to read and understand the results easily. It might also be a good idea to determine whether your screen has a backlight option for when you might need to use it in the dark. The connector leads are what attaches your battery tester to your battery connectors. Make sure that your connector leads can fit most types of car batteries, whether they have large or small connectors. Using your car battery tester may force you to put up in different angles, so there’s a chance that it might slip and fall. Make sure that you get a tester with an anti-slip back or a clip on to prevent any mishaps like this from happening. Most car battery testers are not difficult to use. Just make sure that you get one with no complicated instructions. Check the back of the packaging for instructions just to be sure. Another thing to look for is that the testers should be able to work straight out of the box. Having a car battery tester in the car is essential, lest you need it for an emergency. Thus, its portability is a characteristic you need to look into. Most testers are small enough to fit inside the bag. They are also very lightweight at an average of 1 lb. They should be very easy to carry around or store at the back of your car’s trunk. Choose a well-known and reputable one. It will save you from worrying if it’ll work or not. A good brand usually has stringent quality control, so you know you’re getting your money’s worth in terms of performance, durability, and a longer lifespan. Most car battery testers aren’t expensive. You can get a lot of them for less than $100. In fact, most would fall within the $50 range. So you don’t need to break your bank to get a tester for your battery. As part of your routine care and maintenance for your battery, it’s a great idea to do some load testing with your car battery tester. This is to ensure your battery does not fail out of sudden and caught you by surprise. Also, car batteries will likely to fail more during the cold months. So, the best time to do a load test is during the start of fall. So, before you perform a load test, wear protective gear and goggles when doing the test. Also, keep the battery away from any flammable things as well. Batteries produce hydrogen gas that is extremely flammable. Let’s see how to test a car battery and perform a load test below. Now that you know how to buy for a good quality automotive tester, let’s us look at how to check your car battery? If you’re testing a non-sealed battery, it is suggested that you use a hydrometer. However, make sure you use a good quality one to ensure an accurate result. 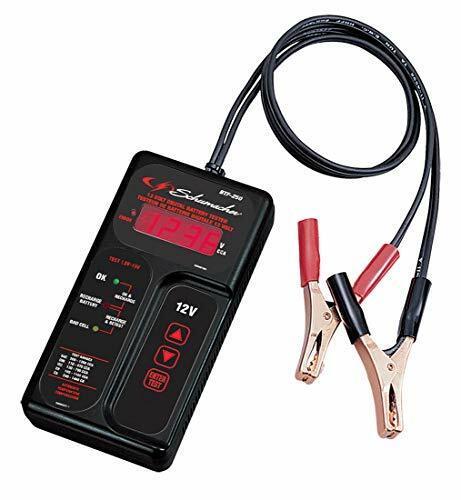 If you’re testing a sealed battery or to troubleshoot a charging or electrical system, you will need a digital voltmeter with 0.5% (or better) accuracy or a car battery tester. Ensure that your engine is not running. Look for your battery’s positive and negative connectors. Make sure to clean them from any lingering gunk and corrosion. Attach the tester’s black wire to the negative connector, and the red wire to the positive connector. Switch on your battery tester. Once switched on, the display on your tester will show the results. If you still have a good battery, you will be able to read 12 volts and above. You should also check out your alternator to know if your battery is correctly charging. For this part, you will need to switch on your engine. If the results of your test fall somewhere under the 13 to 14-volt range, then you’re still okay. This is usually the range that transitions your battery into recharging. If the result falls under or above this range, you might need to have your alternator checked. Now, let’s look at how to perform a load test. With a battery load tester, apply a load equal to one-half the vehicle’s CCA specification for 15 seconds. Testing your battery with a multimeter is easy. A digital multimeter can help you determine whether your battery has enough power for your car in less than a minute. You’ll be aiming for a result of 12.5 volts. Anything lower than 11.8 volts will mean that your battery is minimally charged. Car battery voltage can vary from model to model. It can also depend on whether your battery is recharging at the moment or not. 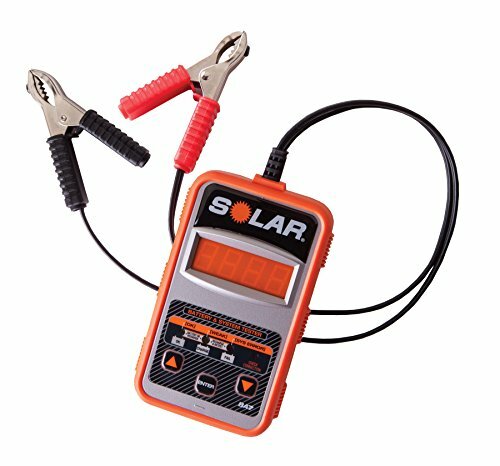 Use different kinds of accessories like a car battery voltmeter, a multimeter, or a hydrometer to measure the current voltage of your battery. A fully charged battery will read at or more when the engine isn’t running. If it is turned on, the display will read around 13 to 14 volts. When the tester reads lower than 12.2-Volt or within 12.9-Volt, your battery may need a slow charge. There are many factors that affect the overall performance and lifespan of a car battery. You will have to consider the climate where you live in. Extremely hot or cold weather can shorten your battery’s life. You also need to think about your driving habits. Frequent, short drives can take a toll on your car more than long trips. When you reach the four-year mark, keep an observant eye on your battery. Better yet, have it checked out by an auto professional. Even if it does not show visible signs of wear, it might still be time to change it for a new one. How can you tell if the car battery you have has already turned bad? The most obvious symptom of a bad battery is when it’s dead. But that doesn’t always happen. Another symptom is slow engine crank, or it doesn’t start your car as fast as it used to. Also, the manufacturing age also plays an essential role in your car’s performance. If your car battery is past its due date, you should start thinking about getting a replacement regardless if it still works fine or not. Want to know what you can do with your old batteries? Check out this article: How to Recondition Batteries.